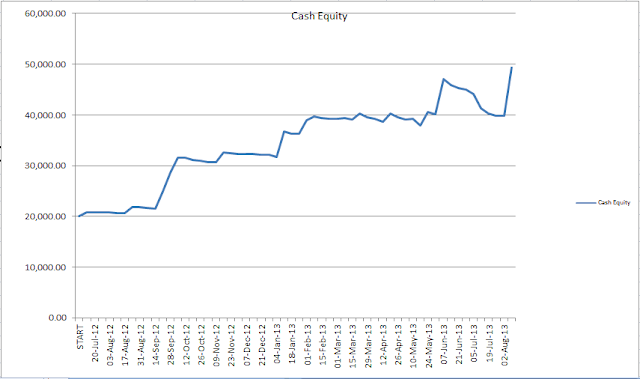 Below I've shown the cash equity chart up to yesterday's close. This is based on my own trades and the detailed performance statistics shown here. In previous posts, I had talked about the staircase effect that was occuring. As you can see, this pattern has changed over the last few weeks, and I will explain how this has occurred. The staircase effect was caused by sharp moves up in equity when profitable trades were closed, and the horizontal part being those periods where there was a mixture of small winners and small losers. However, over the last couple of months there's been a number of positions where decent trades have emerged. Based on the system rules, these trades will be kept open until an exit signal is generated. While those trades kept going, others quickly failed, and were closed for a loss. In addition, I had a couple of positions gap down through my stop levels, wiping out open profits (refer to this post for more on one of them). The combination of a run of small losing trades, coupled with the big loss and a lack of profitable trades being closed meant that the shape of the curve changed. However, while cash equity was going down, the overall returns including the open positions was going up! This week's sharp move up was the culmination of 8 trades being closed. Of those, only 2 were big winners, the rest were either breakeven or small losers. Again, the principle of letting profits and cutting losses short. There are still a bunch of open positions with significant amount of cumulative open profits. As always, price and its movements will determine when they will be closed.